Remember in 2011 after SEAL Team 6 killed Osama bin Laden and Disney wanted to trademark the unit’s name for a collection of toys and games and miscellanea? It’s one of those blips on our collective cultural radar that seems insignificant, yet it points to our tendency to see war and empire as a game, as a form of entertainment, as a product. Our tendency to view foreign lands and peoples as an opportunity for adventure and escape is hardly new, of course. But it certainly says something about our failure to understand and confront the severity of the challenges once we intervened in Iraq and Afghanistan. Recall President George W. Bush’s weirdly wistful comment in 2008 about Afghanistan being a sort of Wild West, a romantic adventure, a place of excitement and danger. Bush said he envied our troops and their opportunity for Afghan romance. It was said about the British that they acquired an empire in a fit of absentmindedness. Did we acquire our empire in a fit of pure escapism? Wanton and wasteful imperial entanglements are only accelerating our national decline. Yet we continue to treat foreign lands as a sort of Disney theme park. 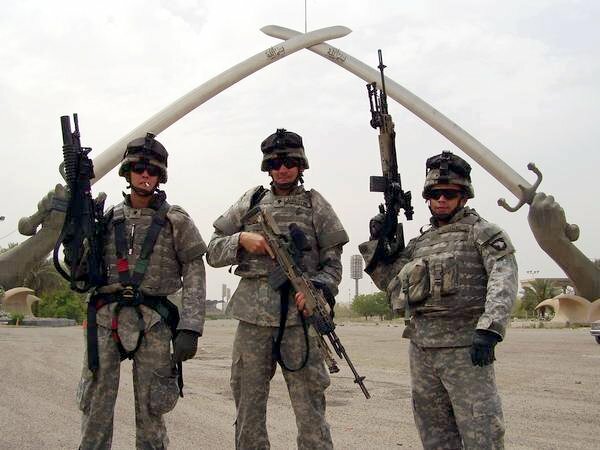 Troops smile and pose under Saddam Hussein’s crossed swords (at least they used to) or in front of Predator drones and other exotic weaponry. Everything overseas is a photo op and an opportunity to win a trophy (or a medal). But even as we seek “romance” and “danger” in foreign lands, a place “to reinvent ourselves,” we paradoxically bring with us all the trappings of consumerist America, hence our steroidal bases with all the conveniences of home (well, in Muslim lands, maybe not liquor, at least openly). And when we get fed up with the natives and roughing it, we know we can just leave. But if Iraq and Afghanistan have taught us anything, it’s that the price of admission is far too high. We should keep our theme parks and our fantasies where they belong: right here in America.